Headquartered in Mumbai, Norinco Private Limited has been well established in India since 1942. The company focuses on sales & installation of a wide range of equipment and services for the marine Industry as well as land based industries in India. 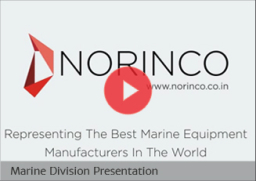 Norinco’s marine division is India’s premier provider of marine equipment and services. We represent over 25 of the world’s leading manufacturers with expertise that spans across a range of operations, from the tendering process to after sales maintenance and repair. Norinco represents highly specialized and Niche manufacturers for land based industry usage. All these companies are leaders in their field., be it Hydrogen Generation, Graphite/carbon products, thermal insulation or extremely high tech, wafer producing equipment.